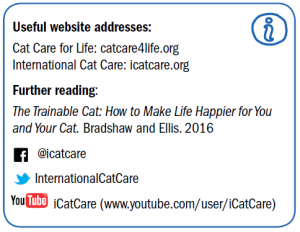 Lifelong preventative healthcare is important to help a cat stay as healthy as possible. Preventative healthcare involves preventing problems arising (such as flea and worm control, vaccination against important infectious diseases and weight management) as well as detecting illness as early as possible. Cats are extremely good at hiding signs of ill health. This is due to their origin as solitary hunting animals – showing signs of ill health could result in them being hunted rather than being the hunter. By the time we notice obvious signs our cat is unwell the underlying disease may be quite advanced. To make it harder, signs of illness an be vague (e.g. lack of appetite) or subtle (e.g. reduced grooming). Cats also have specific needs when kept in a home environment which can impact on your cat’s health and wellbeing. A cat’s territory is very important to them and any changes, even different smells or sounds, can affect them. Consideration should be given to resources within the home, such as litter trays, food and water bowls, resting and hiding places (often in elevated places! ), but also human interaction, other animals within the household and food and feeding regimes. Being able to easily identify your cat is a prerequisite to keeping it safe and well – indoor only cats can escape so all cats should be identifiable. Microchipping is the best way of accurately and permanently identifying cats. The microchip is a small chip that is inserted under the skin. A small scanner which vet practices and other organisations use can read the information on the chip. Once fitted it is crucial that your information is kept up to date on the chip company’s database, otherwise the chip is of no use. If your cat wears a collar, make sure it is fitted correctly and has a safety opening action so that your cat can free themselves if they become trapped by their collar. All cats are likely to pick up parasites during their life. Regular treatment to remove parasites is important not only to remove the impact that parasite has on your cat itself but also due to the possibility of disease transfer. 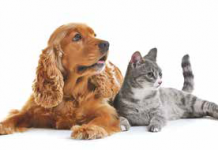 There are many products available to treat external parasites such as fleas and ticks, but it is essential that products used are suitable for cats, as there are some dog parasite products that are toxic to cats. Always check the packaging to ensure the product is used correctly and treatments are repeated as recommended. Internal parasites such as roundworms and tapeworms should also be regularly treated. Almost all kittens acquire roundworms at a very young age, so generally treatment starts from around three weeks of age. Discuss with your vet which product to use and how often to use it as this will alter depending on your cat’s lifestyle and age. It is generally recommended that cats are vaccinated against viruses including cat flu and panleucopaenia alongside feline leukaemia virus in the UK. Generally vaccines are started around 8-9 weeks of age with a second vaccination around 3-4 weeks later. A booster vaccination 1 year later is required and then the frequency of vaccination will vary depending on the individual circumstances, so this should be discussed with your vet. Other vaccines are also available and their use will depend on the lifestyle and risk of each individual cat coming into contact with the virus or bacteria. During every routine health check your vet will want to accurately weigh your cat, check its body condition score and review its nutrition. Recording your cat’s body weight and body condition score at each visit allows you and your vet to see any changes or emerging trends which may relate to an underlying problem. Assessing bodyweight is important for checking normal growth of kittens and to keep any eye for weight gain in middle-aged cats as being overweight will predispose to many different diseases. 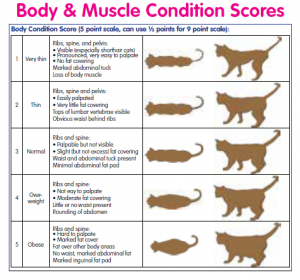 You can assess your cat’s body condition score at home – look at your cat’s shape and feel their ribs and waist and check where they fit on the scale from 1 to 5 (emaciated to grossly obese). 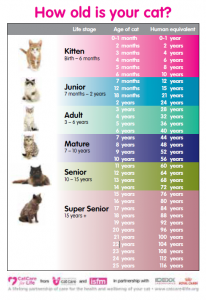 The frequency of healthchecks will change depending on your cat’s age. As for humans young and old cats will need more frequent checks. As a cat ages, the equivalent of an annual check for us is actually more like a 6 monthly check for a cat. Regular healthchecks for kittens usually coincide with their first vaccination. However, although vaccination is very important it is also just as important during the kitten stage to have regular checks to ensure the kitten is kept in optimal health. Other important aspects to discuss include lifestyle choices (e.g. 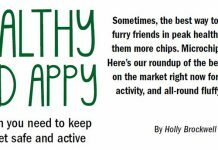 indoor only or restricted access to outdoors, resources in the home), diet and identification (e.g.microchipping). It is widely recommended that cats are neutered at around 4 months of age as they generally reach sexual maturity between 4 and 6 months of age. Whilst a kitten is young, it is also a good time to introduce some training – getting a kitten used to spending time in their cat carrier, being handled (such as their paws being touched, mouth being opened) as well as grooming. This training helps a cat cope with the handlng required for healthy checks and treatment they may need in the future. Cleaning your cat’s teeth with a toothbrush is the best way to keep their teeth clean. Although it may seem impossible, cats can be trained to accept to accept toothbrushing, especially if this is started at a young age. When a cat reaches the Junior stage (7months – 2 years) infectious diseases and problems related to fighting, hunting and trauma can become more common – young cats are active and love to explore! As your cat matures physically and emotionally, attention to their environment is important (eg do they have access to all of the things they need? ), as well as monitoring their diet and bodyweight (check for weight gain after neutering). During their Adult life stage (3-6 years), it is easy to forget about routine parasite control and dental and/or gum disease. However, over 70% of adult cats have dental and/or gum disease and this can lead to considerable pain and loss of teeth. Regular checks, at least annually, mean that any problems will be detected early, hopefully before significant disease develops. Where dental disease is found, it is often necessary to examine the mouth more thoroughly under a general anaesthetic, allowing cleaning and dental work to be done at the same time. When a cat reaches the Mature stage (7- 10 years) many cats still look youthful and remain playful, but there is an increased risk of ‘older cat’ age-related problems developing. Typical examples of these diseases include diabetes, kidney disease, high blood pressure, overactive thyroid glands and cancer. Monitoring can detect changes that occur as these diseases develop. This may include collection of urine or blood for routine tests and blood pressure measurement. 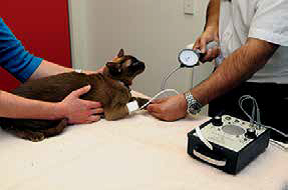 Measuring blood pressure is well tolerated by most cats and usually only takes a few minutes and involves placing an inflatable cuff around a leg or tail (very similar to how our blood pressure is measured!). Obesity is also common in Mature and Senior (10-15 years) cats, so extra care needs to be taken with feeding. Remember changes in bodyweight can easily go unnoticed over time and can be especially difficult to recognise in longer-haired cats. 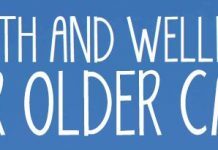 At Senior and Super Senior (over 15 years) stages, several things can go wrong at the same time! However, many diseases are still very treatable, so don’t simply put any changes in your cat down to ‘old age’ and ignore them! Cats can also suffer from the equivalent of senile dementia, where they may become confused, withdrawn, wander aimlessly and vocalise (meow) excessively. However, these signs can occur with other diseases too, so a full examination is always needed. Other changes to look out for in older cats include dehydration and constipation. They may also spend less time grooming, which can lead to coat and skin problems and their claws can become overgrown. Older cats may eat less because their sense of smell is not so good, or because they have teeth or gum problems. Their cat’s digestive system may also not work so effectively and this may also contribute to weight loss. Older cats thus need to be monitored even more closely for signs of illness. And your vet can guide you with measures to support your older cat. A preventative healthcare plan created with your vet will help your cat keep healthy and happy throughout all its different lifestages. With good care, many cats are now leading happy and active lives well into their teens and some considerably older!